The Standard Schnauzer goes back to the fifteenth century. He did not have the stylish life of silken pillows, but the plebian life of the trusted guard and family dog of the working class. Schnauzer-like dogs appear in several art works of this early period. In Mecklenborg, Germany, there is a statue dating from the fourteenth century of a hunter with a Schnauzer crouching at his feet. The Schnauzer again appears in statuary in “The Night Watchman”, dated 1620 in Stuttgard, Germany. In the fifteenth and sixteenth century, tradesmen used Schnauzers to protect their wagons as they traveled the countryside with carts laden with wares. These hardy, reliable guard dogs were of a size not to take up too much space in the wagon, but were fierce enough to repulse robbery. The word “Schnauzer” appeared in dog literature for the first time in 1842 when used as a synonym for the Wire-haired Pinscher. The Wire-haired Pinscher was accepted as a pure individual breed around 1850. Fitzinger, the Viennese zoologist (1802-1884), described the Wire-haired Pinscher as a cross between the Dog of Bologne and the Spitz. A subsequent cross of the German Black Poodle and the gray Wolf Spitz upon the old German Pinscher stock produced the type seen in his time. He described the face as furnished with shaggy hair which is longer and almost beard-like around the muzzle and said that not infrequently the ears and tail are cropped. The oldest German Kennel Club was founded in 1878. This was the start of the German Stud Book and from this year forward regular shows were held. At the 3rd International Show in Hanover in 1879, Wire-haired Pinschers were exhibited for the first time on record. First prize winner was a Wired-haired Pinscher called “Schnauzer”. It is known that the Germans began using the reliable Schnauzers for police work around 1914. The Standard Schnauzer was used by the Red Cross for guard duty during World War I and also by the German Army as dispatch carriers. Their dependability made them favorites of both groups. The Standard Schnauzer was the original Schnauzer from which the miniature and giant were developed. The first importation of the Standard Schnauzer into the U.S. was around 1900. It was not until after the World War I that the breed was brought to the United States in any significant numbers. Popularity of the Standard Schnauzer grew steadily as is indicated by the number of dogs registered with the American Kennel Club. The Standard Schnauzer was once a part of the terrier group but was reclassified to the working group in 1945 where it remains today. The Standard Schnauzer in America has excelled in the breed ring producing many Group and Best in Show wins, excelled in the obedience ring with several obedience champions (OTCH), and has, most importantly, excelled in our hearts and homes. 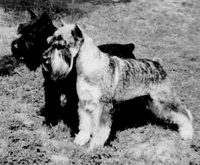 The Standard Schnauzer Club of America was formed 1933. The Potomac Valley Standard Schnauzer Club was started in 1962 when it became a member club of SSCA and was recognized by the AKC.